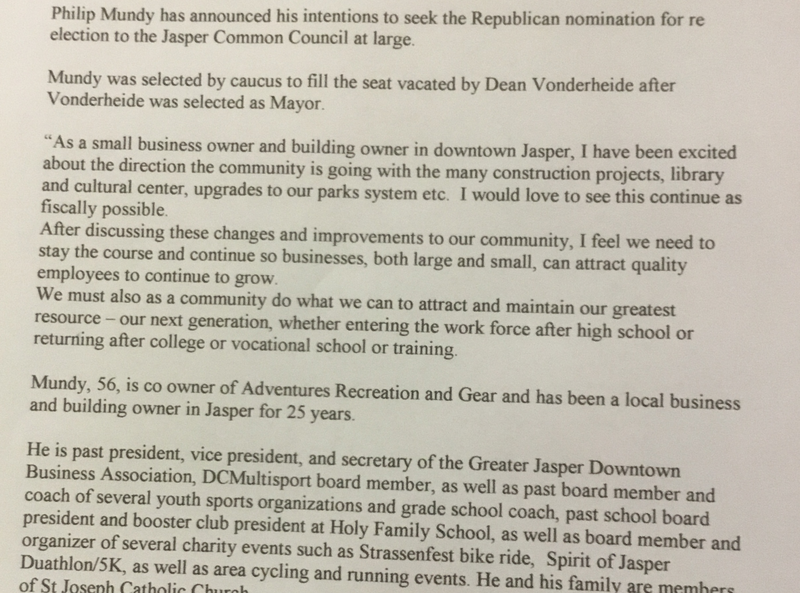 JASPER -- Philip Mundy has announced he’ll seek the republican nomination for re-election to the Jasper Common Council. It’s new mayor Dean Vonderheide’s old “at-large” seat. A caucus met earlier this month to elect Mundy to take over the rest of Vonderheide’s council term. In his announcement, Mundy says, as a small business and building owner downtown, he’s excited about the direction the community is going. He pointed to the construction projects including the library and cultural center, and upgrades to local parks. He says he hopes to continue that growth as fiscally as possible. You can read his full announcement below.